Background: Hyperadiponectinemia is an indicator of worse outcomes in advanced heart failure (HF), its role in de novo HF is less clear. Objective: Because this protein is a hormone with starvation properties, we wanted to know its association with nutritional state and its regulator factors in de novo HF. Methods: Adiponectin circulating levels were determined by ELISA at discharge in patients admitted for de novo HF (n=74). Nutritional status was determined by CONUT score. Univariate and multivariate Cox regression analyses were employed to calculate the estimated hazard ratio (HR) with 95% confidence interval (CI) for death or all-cause readmission. Stromal vascular cells (SVC) of EAT and subcutaneous adipose tissue (SAT) from patients (n=5) underwent heart surgery were induced to adipogenesis for 18 days. Then, cells were cultured with complete or starved medium for 8 hours. At the end, adiponectin expression levels were analysed by real time polymerase chain reaction. Results: Patients were grouped regarding nutritional status. There was a strong association between high adiponectin levels and failing nutritional status. Those patients with worse nutritional state had the highest adiponectin and proBNP levels at discharge (p<0.01). Both proteins were slightly correlated (p<0.05). However, only high adiponectin levels were independently associated with death or all-cause readmission. Nutrients starvation upregulated adiponectin expression levels in adipogenesis-induced SVC from EAT or SAT. Conclusions: Worse nutritional state in de novo HF patients is associated with higher adiponectin plasma levels. Their levels were upregulated in adipose cells after being nutrients-starved. These results may help us to understand the adiponectin paradox in HF. Adiponectin is mainly produced by mature adipocytes ; it has anti-inflammatory [2,3], insulin sensitizing and anti-atherogenic properties [4,5] due to its ability of stimulate the production of nitric oxide in vascular endothelial cells . The absence of adiponectin, as it was showed in adiponectin knockout mice, exacerbates myocardial injury and cardiac dysfunction . Thus, several studies have showed that low adiponectin levels in plasma and epicardial adipose tissue (EAT) were associated with coronary artery disease (CAD) [8-10] and its risk factors are involved in heart failure (HF) development . This is a complex syndrome due to hemodynamic, neurohormonal, inflammation and metabolic disorders . However, in a paradoxical way, high adiponectin levels were associated with poor cardiac function, symptomatic clinical status and high mortality in chronic HF patients . Therefore, the reduction of adiponectin levels during hospitalization improved the patients' prognosis . In patients with chronic HF and cardiac cachexia, the increment of this protein levels might be related to inflammatory response caused by injury  . Its secretion by adipose tissue may be regulated by plasma brain natriuretic peptide (BNP) and cytokines , weight loss  or advanced catabolic states like cachexia . Other authors have suggested that high levels of adiponectin could be due to the adiponectin resistance in patients with cardiovascular diseases  including HF . Although adiponectin is produced by adipocytes, paradoxically, malnourished underweight female anorexic patients also contain high adiponectin levels which are declined after refeeding and weight gain . Contrary, obese patients have low plasma adiponectin levels which are rise with weight loss . The prognostic value of adiponectin in de novo HF is less known, so we tried to study its relationship with the nutritional state, as well as, its possible regulator factors in this group of patients. This is a retrospective and observational study that included 74 consecutively admitted patients in the Cardiology Department of our hospital between May 2014 and August 2015 with the diagnosis of de novo HF. Heart failure diagnosed was made according to the recommendations of the European Society of Cardiology Guidelines . We have excluded patients with decompensated chronic HF, presence of pregnancy, severe chronic liver or renal disease, autoimmune or chronic inflammatory diseases, recent (last 3 weeks) infectious process, recent (last 3 weeks) treatment with corticosteroids or anti-inflammatory drugs, known tumor processes at the time of inclusion in the study, blood disorders and an unknown nutritional status. The study complies with the Declaration of Helsinki and was approved by the Clinical Research Ethics Committee of Galicia. All patients signed an informed consent. At admission, anthropometric and demographic data, cardiac and renal function parameters, glucose and lipid profile, haemogram, pro brain natriuretic peptide (proBNP) values and nutritional status, measured by CONUT score  were collected from all included patients. Monocytes subsets were determined as it was described . The CONUT score uses the following three parameters: the serum albumin level (g/dL), total cholesterol level (mg/dL), and lymphocyte count (count/mL). It thus enables evaluation of the protein reserves, calorie depletion, and immune defenses, respectively. We classified the patients according to the CONUT score in normal nutritional status (CONUT 0-1 points), mild malnutrition (CONUT score 2-4 points) and moderate to severe malnutrition (CONUT score > 4 points) . Blood samples were obtained at discharge as we previously described  and were centrifuged at 1800 xg for 15 minutes. Isolated plasma was stored at -80 ºC until be used. Adiponectin levels were measured by DuoSet Enzyme-Linked ImmunoSorbent Assay (ELISA) kit with a detection limit of 0.6 ng/mL (R&D Systems, Minneapolis, MN, USA) following manufacture´s protocol. The endpoints were death from any cause and rehospitalization for all cause. Follow-up information was recorded from medical history. The mean of follow-up was 521 (9-820) days. Epicardial and subcutaneous stromal cells were obtained from adipose tissue biopsies of five patients after signing inform consent and undergoing open heart surgery, as it was described previously . Then, cells were maintained and subcultured twice in medium M199 (Lonza Biologics Porriño S.L., Pontevedra, Spain) supplemented with 10% fetal bovine serum (FBS) (Promega Biotech Ibérica S.L., Madrid, Spain). Fifteen thousand of cells per well were seeded in 24 well-culture plates and adipogenesis was induced with adipogenic factors (Sigma-Aldrich Quimica S.L., Madrid, Spain) with three replacements a week, as it was previously described . After three or four weeks, mature adipocytes were visualized by microscopy. A group of cells were starved with medium M199 and saline solution (1:1) supplemented with 1% of FBS, other group was maintained with medium M199 and 1% of FBS, other group with starved medium supplemented with 10% FBS and the last group was the control with medium M199 and 10% FBS. The starvation was made for 8 hours. Then, RNA was extracted by RNeasy Plus MiniKit (Qiagen GmbH, Hilden, Germany) as manufacture´s protocol recommendations. RNA was retrotranscripted into cDNA using the Maxima First Strand cDNA Synthesis Kit (Thermo Scientific, Madrid, Spain) in a thermocycler (25°C for 10 minutes, 50°C for 15 minutes, and then 85°C for 5 minutes). Two µL of cDNA was amplified in a total volume of 20 µL with FastStart SYBR Green Master (Roche Diagnostics S.L., Barcelona, Spain). Real-time polymerase chain reaction (PCR) was performed with 2 microliters (µL) of cDNA, SYBR Green and 300 nM of specific primers for adiponectin (ADIPOQ) and β-actin (ACTB), previously described . The thermal profile was (95°C for 30 sec and 60°C for 30 sec) for 40 cycles (Stratagene Mx3005P, Agilent Technologies S.L., Las Rozas, Spain). The cycle threshold (Ct) values of ADIPOQ were normalized by the Ct values of ACTB. The differential expression between treated and control points was represented as a fold change by the 2-ΔΔCt algorithm. Clinical characteristics of all patients were expressed as mean±standard deviation (SD) in only continues variables or as percentage (%) in those categorical variables. Differences among groups of patients were expressed at the same manner and their comparison was performed by ANOVA in variables with normal distribution and Kruskal-Wallis test in those skewed. Comparison between treatment and control was analyzed by paired t test. Differences of categorical variables among subgroups were performed by chi-squared test. Non parametric correlation between adiponectin and proBNP was performed by Spearman´s rank coefficient. Pearson correlation coefficient was used for association between adiponectin and total cholesterol levels. Univariate and multivariate Cox regression analyses were employed to calculate the estimated hazard ratio (HR) with 95% confidence interval (CI), where it was appropriate. The variables were entered into a multivariate model for factors with a p value of ≤0.05 in the univariate analysis. The Statistical Package for Social Science (SPSS) for Windows, version 15.0 (software SPSS Inc.; Chicago, Illinois, USA) was used for all statistical analyses. Statistical significance was defined as p<0.05. The classification regarding nutritional state determined 31 patients with normal nutrition, 35 with mild malnutrition and 8 were moderate-severely malnourished. These groups differed respect to haemoglobin, albumin, leukocytes, proBNP and adiponectin levels. Thus, patients with the worst nutritional state had lower levels of haemoglobin and high proBNP and adiponectin levels compared with patients with normal or mild nutritional state (Table 1). Our results showed that the normal nutritional state is characterized by low adiponectin levels at discharge (7.14 ± 4.48 µg/mL; n=31). Those patients with mild nutritional state had a slight increment (7.93 ± 4.06 µg/mL; n=35). Finally, patients with moderate- severe nutritional state presented the highest adiponectin levels (13.71 ± 6.96; µg/mL; n=8). These differences among groups reached the statistical significance (P<0.01) (Figure 1). Our data confirmed the association between proBNP and nutritional state or adiponectin levels (Supp. Figure 1). Although patients with overweight or obese presented the lowest adiponectin levels, the differences didn´t reach the statistical significance (Figure 2). Thus, 11.61 ± 4.06 µg/mL of adiponectin was found in patients with BMI<25 kg/m2, 7.77 ± 3.96 µg/mL levels in patients with BMI between 25 and 30 kg/m2 and 8.08 ± 5.82 µg/mL in patients with BMI > 30 kg/m2. Univariate analysis determined that only proBNP and adiponectin, differential factors associated with nutritional state, were risk factors of death or all-cause readmission (Figure 3A). However, multivariate analysis determined high adiponectin levels as the independent risk factor (Figure 3B). Stromal vascular cells isolation from epicardial or subcutaneous fat pads, were adipogenized until adiponectin expression detection. Finally, cells were starved for 8 hours. 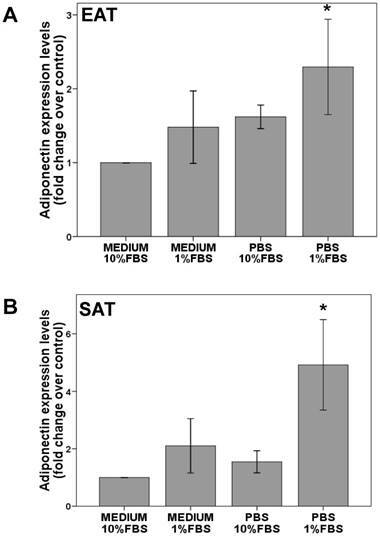 The reduction from 10% to 1% of serum (FBS) increased slightly adiponectin levels in EAT (1.5±0.5 fold change over FBS 10%) or SAT cells (2.1±0.9 fold change over FBS 10%). However, this increment reached statistical significance with serum and nutrients starvation in EAT (2.2±0.3 fold change over control; p<0.05) and SAT (8.0 ± 2.3 fold change over control; p<0.05) cells as it is shown in Figure 4. BMI: Body mass index; LVEF: Left ventricle ejection fraction; MI: myocardial infarction; T2DM: Type 2 diabetes mellitus; HTA: Hypertension; HLP: Hyperlipemia; proBNP: pro-Brain natriuretic peptide; ACEIBs: Angiotensin converting enzyme inhibitor-Angiotensin receptor blockers; ARM: antagonist mineralocorticoid receptor; Hb; Hemoglobin. Adiponectin levels regarding nutritional state. 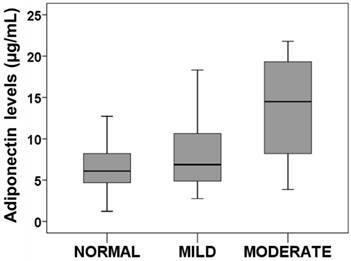 Box plots represents plasma adiponectin levels at discharge in patients with normal, mild, moderate nutritional state. Anova test determined statistical significance p<0.01. Adiponectin levels regarding obesity. 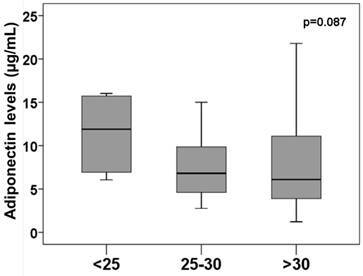 Box plots represents plasma adiponectin levels at discharge in patients regarding obesity. Non statistical significance among groups. For the first time, our group has showed that high adiponectin levels are associated with malnutrition and worse prognosis in de novo HF patients. Moreover, we found that starvation upregulates adiponectin expression levels in epicardial and subcutaneous stromal cells after adipogenesis induction. This result contributes to understand the paradoxical behavior of adiponectin in HF patients. Nowadays malnutrition is a common comorbidity in advanced HF and the nutritional status is considered as a marker and a mediator of the disease´s progression, severity and prognosis . However in de novo HF patients its prognostic value is less clear. In our study we found that about 10% of patients with de novo HF are moderate-severely malnourished and we described that this state is characterized by high adiponectin and proBNP and low hemoglobin levels. This result reinforced the need of determining the nutritional status in de novo HF patients. Adiponectin is mainly produced by adipocytes  with cardioprotective properties  in vasculature and myocardium cells. Traditionally obesity is associated with an increment of adipocytes but paradoxically exists a downregulation of adiponectin levels . This reduction drives up insulin resistance  and in consequence cardiovascular disease. Contrary, anorexia nervosa with an adipose tissue mass reduction is associated with hyperadiponectinemia , higher insulin sensitivity , mild anaemia and moderate leucopoenia . Likewise, patients with de novo HF and moderate-severe malnutrition presented the highest adiponectin levels. However, we didn´t find a clear association with BMI. Despite of the adipose tissue is the main adiponectin producer, we didn´t find any correlation between body fat mass and its circulating levels. However, there was a clear inverse association with total cholesterol levels, which is used for CONUT score calculation, as it was previously described [34,35] (Sup. Figure 2). These results suggest that adiponectin levels are more dependent on the nutritional state than BMI in de novo HF. Forest plot represents Hazard ratio (black circle) and 95% confidence intervals (horizontal lines) of variables association with death or all-cause readmission. Univariate (A) or multivariate (B) Cox regression analysis. Some studies highlighted hyperadiponectinemia could be due to an adiponectin resistance in cellular receptors , similar to insulin resistance, promoting metabolic dysfunction and HF syndrome . However, adiponectin is an insulin sensitizer and we didn´t find any differences regarding diabetes presence (data not shown). This may indicate that another factor is the main cause of high plasma adiponectin levels in de novo HF patients. Thus, we focus our attention on the association between malnutrition and adiponectin. Malnutrition entails energy reduction with catabolic/anabolic imbalance that leads to cachexia . Our results showed that starvation of nutrients and circulating factors upregulated adiponectin levels in adipogenesis-induced stromal cells from epicardial or subcutaneous fat cells. The absence of fat stores, as well as in chronic anorexia nervosa and in malnutrition , can be the main reason of hyperadiponectinemia in patients and explain its paradoxical behavior in HF. As it was previously described we found a positive relationship between adiponectin levels and proBNP levels . 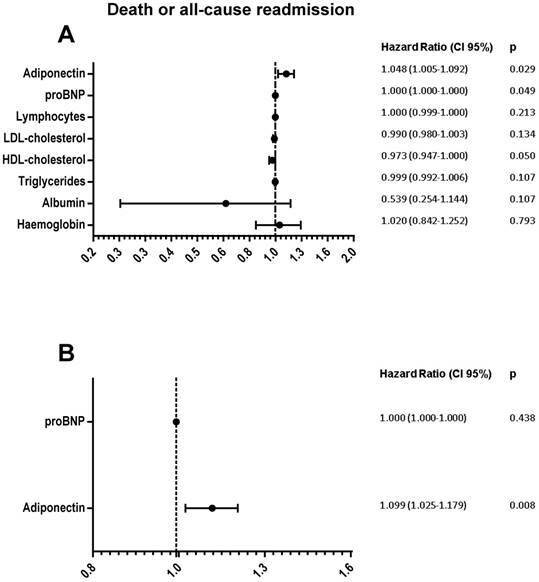 We also described that adiponectin is a prognostic factor in de novo HF (figure 4) independent of the NT-proBNP levels suggesting that high adiponectin levels in these patients could be a mediator of the disease progression. Our results identified that patients with high adiponectin levels in de novo HF had worse nutritional status and worse outcomes suggesting that they were in a more advanced phase of the disease and efforts should be focus on them to avoid the progression of the disease. Although more mechanistic insights are necessary to understand the adiponectin regulation in HF, our results contribute to the knowledge of this molecule as indicator of nutritional state. Since a huge increment of adiponectin levels can be mediators of chronic obstructive pulmonary disease  and HF, a nutritional intervention in these patients might normalize adiponectin levels, which can modulate cardiometabolic disorders  and reduce -HF progression. Adiponectin expression levels in adipogenesis-induced EAT (A) or SAT (B) stromal vascular cells. After adipogenesis induction for 14 -18 days, cells were cultured for 24 hours with medium+ (10% or 1%FBS) or starved medium (10% or 1% FBS). Paired t test determined statistical significance p<0.05 between PBS 1%FBS and medium+10%FBS (control). N=5. The main limitation of our study is the number of patients; however the results are consistent and statistically significant. It is a unicentric, retrospective and observational study with the limitations inherent to this type of design. We use the CONUT score which is not best match with the subjective global assessment of nutritional status in HF patients but it is very easy to use in hospitalized patients. High adiponectin levels in patients with de novo HF are associated with worse nutritional status. Starvation regulates adiponectin expression levels in epicardial and subcutaneous fat cells and may explain its behaviour in HF. We would like to thank patient's participation. The present study was supported by Complejo Hospitalario Universitario de Santiago de Compostela (Santiago de Compostela, Spain), Fondo de Investigaciones Sanitarias (PIE13/00024) and (PI13/01852) from Plan Estatal de I+D+I 2013-2016 and cofounded by ISCIII-Subdirección General de Evaluación y Fomento de la Investigación el Fondo Europeo de Desarrollo Regional (FEDER).